Taipei, Jan. 22 (CNA) EVA Air said Tuesday that it values the safety and wellbeing of its employees, after it was accused of not backing its crew members in an incident of alleged inflight sexual harassment last week. The incident was reported by a female flight attendant, who alleged that she and her co-workers were coerced by an overweight passenger to help him remove his underwear and wipe his behind during a flight from Los Angeles to Taipei on Jan. 19. In response, the Taiwanese airline said Tuesday its employees are the lifeblood of the company. 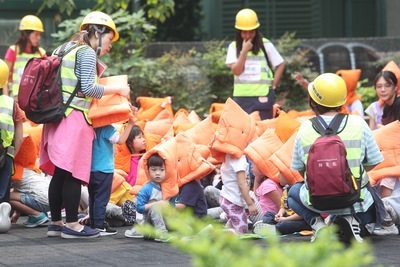 "We take their safety and wellbeing very seriously," EVA Air said in a statement. "Our guidelines for passengers with special needs mirror those of the U.S. Department of Transportation and obligate passengers to provide prior notice if they require special assistance during flights." "Our cabin crews are NOT required to assist passengers in use of lavatories, feed them or administer medications," the Taiwanese airline said. It said cabin crews can follow its guidelines for handling unexpected disturbances when passengers make unreasonable demands. "They can refuse the demand, provide a verbal warning and take other steps that may be necessary," EVA Air said. "Our priority is always the safety and wellbeing of our passengers and cabin crews." On Monday, a female flight attendant, accompanied by representatives of the Taoyuan Flight Attendants Union, said at a press conference that the man, who was thought to be American and was confined to a wheelchair, informed her that he required assistance going to the bathroom about two hours into the flight. "I felt that as a flight attendant, removing a passenger's underwear was beyond the scope of my responsibilities," said the deputy head of cabin service. At the press conference, the workers' union said the incident clearly constituted sexual harassment and it asked that EVA Air sue the passenger, who allegedly had caused trouble several times before on the airline's flights. According to the union, it learned that the passenger in question had defecated in his underwear during an EVA Air flight in May 2018 but the airline did not blacklist him. Rather, EVA Air has been leaving its flight attendants to deal with the man every time he flies with the airline, the union said. The union urged EVA to establish a standard operation procedure that would include a requirement for physically challenged passengers to be accompanied by a caretaker and for flight attendants to have the final say if they are asked to do something that makes them uncomfortable or they consider unreasonable. Later Monday, EVA issued a press statement saying flight attendants are perfectly entitled to refuse passengers' requests they consider inappropriate. The company said it fully supports its flight crew and is prepared to offer assistance, if needed, to sue the passenger.